Described as Japan's answer to Oasis, WINO makes no qualms about the tremendous influence of UK bands -- the Beatles, in particular. Guitarist Togawa Shinichiro and bassist Kawasoe Hiroyuki list the Beatles as favorites, while drummer Kuronuma Masataka names John Lennon specifically. WINO's music refracts first generation British rock and psychedelia through a post-alternative lens. Oasis, indeed. Atsushi, Togawa and second guitarist Hisanaga Chokko got together in September 1995 to form "Bogu Maitorustaa" (the katakana isn't clear if this name means anything.) 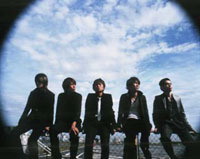 Kawasoe and Kuromuna joined the band two months later, solidifying the line-up. In March 1996, Bogu Maitorustaa changed its name to WINO and began playing regular gigs in Kitazawa. Later that year, Gods pop Records included two songs by WINO in its compilation "Return of Guitar Lightning Horror Smilin'", the first of many such collections WINO would appear. Two years later, WINO traveled to England and recorded with producer Dave Charles. After releasing two singles under its own name on independent labels, WINO was signed to Speedstar in September 1998. Since then, the band has steadily toured and recorded. WINO's "Taiyoo wa Yoru mo Kagayaku" was featured in the anime Hunter X Hunter. Atsushi also appeared on Bugy Craxone's 2001 album This is New Sunrise. In November 2002, WINO announced it was breaking up. Lion, a career retrospective, was released in January 2003.